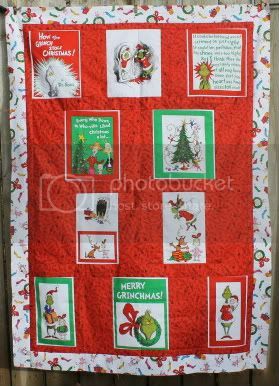 15 minutes a day and I have a Grinch quilt top! I realized this weekend that the first holiday deadline I had was Nov. 27 for Advent...and I hadn't started the Advent Calendar yet. I'm doing this one from Moda Bake Shop, and boy they're not kidding when they say it's easy. Whipped this pile up in no time. I'm going to let the embroidery machine add the numbers, and this sucker should be on the wall in no time. I'm also combining linky parties again. 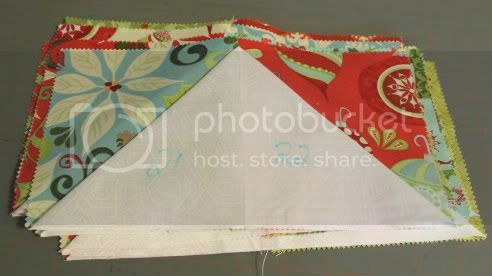 Over at the Quilter's Table, she hosts a recipe link up on Tuesdays. I'm not a great cook and all my recipes are from Alton Brown or All Recipes. However, I do have my favorite sweet potatoes recipe from my mother. Copied directly from her email to me. cook until the potatoes are soft, maybe 25 minutes? then thicken the liquid with cornstarch mixed with water - maybe a tablespoon of cornstarch and 2 tablespoons of water? Don't you love the exacting details of a family recipe? It's still usually the only thing I get right. Check out how others are managing their time at Life in Pieces and other holiday recipes at A Quilter's Table!